One way to answer this question is to begin with a clear and complete definition of film noir. Unfortunately, that task has eluded greater minds than mine. Is noir a genre, a style, or a historical series of films? Yes and no, in all cases. The crime film can also be called a genre, for example. Its contents emphasize the planning and/or execution of a crime, its fallout, and issues of (re)instating justice. The plots involve specific character types, including criminals (from thieves and hitmen to crooked executives) and representatives of justice, such as police officers, FBI agents, and sometimes private investigators. The criminals may succeed or fail in their endeavors, but we do not identify with them. The classic crime film is most often about why and how crime “doesn’t pay.” The genre also emphasizes stark realism, from its urban settings to its excessive violence. Film noir may emphasize many of these elements; however, it can differ subtly or significantly. In film noir, we often sympathize with the criminals, whose perspectives dominate the film. 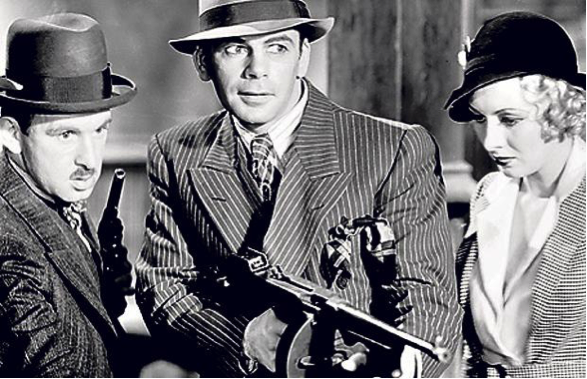 Even when crime films center on the life and times of charismatic mobsters—Scarface (1932), Little Caesar (1931), Dillinger (1950)—we are not encouraged to sympathize with them. The criminal anti-hero is a product of noir, which developed in some ways from the early gangster pictures. Both perspective and historical era are often used to distinguish the two, with gangster pictures being primarily a pre-WWII phenomenon and noir a post-war development. A broader difference is how noir may cut across genres. There are noir melodramas—The Secret Love of Martha Ivers (1948), Mildred Pierce (1945)—and noir westerns, too—3:10 to Yuma (1949), The Capture (1950). This leads some critics to reject the idea that noir is a genre at all. Lighting and mise-en-scène also differentiate film noir from the typical crime film. The style of noir is perhaps its most identifiable facet. To emphasize that it is the world that is unpredictable and dangerous and not the individual, chiaroscuro (Italian for light-dark) lighting and Dutch angles (tilted cameras) dominate. 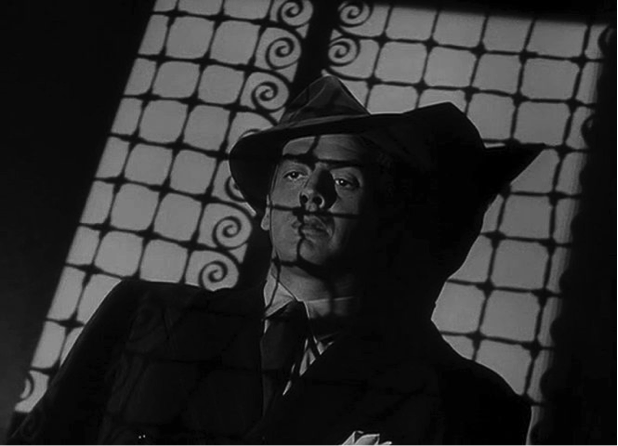 The use of light through window blinds and stairways that symbolically imprison characters is another feature of noir style. Sets are poorly lit (in part a response to the low budgets of most noir productions) and streets are often wet and ill-lit. The result is films that make the audience uncomfortable and apprehensive, just as most of the characters are. The soundtrack is another key noir element, with emphasis on jazz rhythms and dissonance over the romantic melodies that dominate most other Hollywood genres. In terms of style, the gritty realism and atmosphere of distrust and corruption certainly links the film with noir, as does the aura of pessimism and distrust, even as the cinematography is less stylized than the typical noir. By contrast, the film’s music, by Miklós Rózsa, is definitely identifiable as noir in its jagged dissonance. Rózsa is renowned for his work on many important noir films, including Double Indemnity (1944), The Killers (1946), and Criss Cross (1949). The film’s legacy also provides perspective on how it might best be identified. 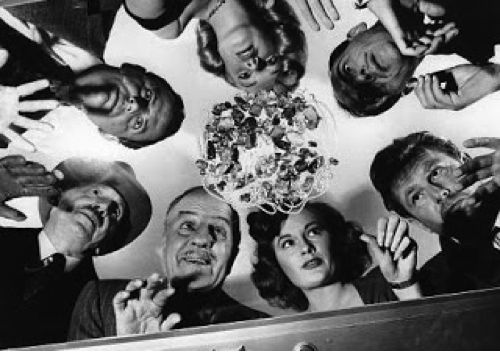 Critics have called The Asphalt Jungle the best heist film ever or at least one of the most influential crime films of its era. Far less attention has been given to it by critics of film noir. With this inconclusive portrait, if we still want to decide whether the film fits the noir label or not, we must turn to perspective—where our sympathies lie. I feel confident in saying that none of the criminals in The Asphalt Jungle is truly sympathetic, from the calm and perversely voyeuristic German “Doctor” Riedenschneider (Sam Jaffe) to the greedy and adulterous Alonzo D. Emmerich (Louis Calhern)—whose plaything (Marilyn Monroe as Angela Phinlay) calls him “Uncle Lon” as she sits on his lap and kisses him passionately. Hunchback getaway driver Gus (James Whitmore) can be admired for his trustworthiness to his fellow criminals, I suppose, and lock-picker Louis (Anthony Caruso) does seem to truly love his wife and child. But these characters are not well developed, and this is not the identification we find in noir, where the line between “good guys” and “bad guys” is often either razor thin or nonexistent. By contrast, we can sympathize with Louis’ symbolically named wife Maria (Teresa Celli) when her wounded husband is brought home to die and she takes her anger out on Gus for not protecting him. When the police bust in on the funeral, we again feel for Maria, now clad in black and praying. Complicating matters further, we are discouraged from identifying with corrupt cop Ditrich (Barry Kelley), while the Police Commissioner (John McIntyre) is granted a lengthy and persuasive speech to the press about the vital role of the police in upholding law and justice in the city, despite a few bad eggs. This leaves us with only the “hooligan” and the woman who loves him to consider. 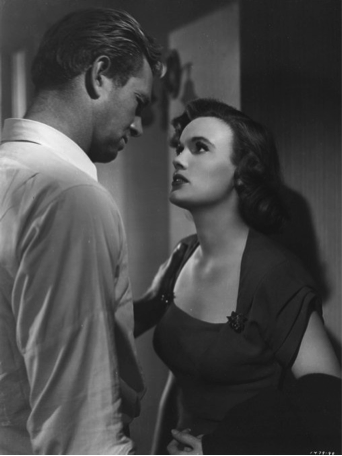 Dix (Sterling Hayden) and Doll (Jean Hagen) share a strange friendship that Dix might turn to a sexual relationship, while Doll seems to be aiming for marriage. When Doll spends the night at Dix’s after being locked out of her own apartment, we see more of Dix—the only character in the film to be given a backstory. Doll hears him talking in his sleep about his family’s farm and the black colt he loved but his father sold. 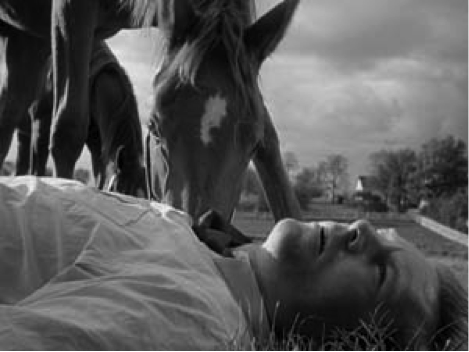 This same colt becomes his driving obsession in the film’s final moments. Dix’s desire for it (and the innocent childhood it signifies) keeps him alive as he drives “home” to the farm with Doll—faithful without reason to the last—providing perspective as she cries beside him. When at last Dix arrives, he runs into a small field with a few horses in it, feeling that if he can somehow keep his father from selling the black colt all will be well. He seeks to reverse time and collapses in the field with this single thought in his mind as he dies. These final moments can serve to answer the noir versus crime film debate for The Asphalt Jungle if we wish them to, for Dix’s desire to return to innocence is perhaps one many viewers can share, and it renders him human. It is also the only scene after the credits to feature the soundtrack, Rózsa’s evocative tribute. Although the Commissioner’s speech is the kind of pronouncement on justice we see in many a crime film, Dix’s simple, sad worldview provides a perspective that is all noir. Ultimately, The Asphalt Jungle illustrates well the intersections of noir and crime film and why it can be so difficult to fully differentiate the two.